Katakanus are very stable, twin-hulled boats that can seat up to 6 people (up to 450kg maximum). Great for inexperienced paddlers looking to explore around the shores of Loch Tay Highland Lodges for a few hours, perhaps taking a flask along for a cup of tea with an awesome view. 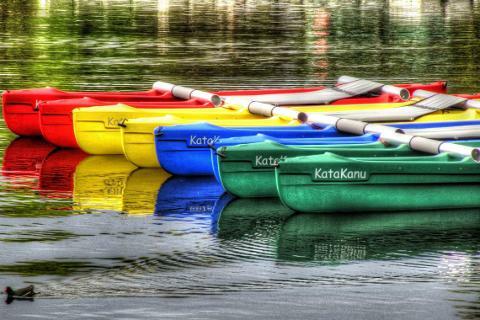 The Katakanus come with buoyancy aids (life jackets for small children) and paddles. We can also give you a large dry bag to keep your valuables and sandwiches dry. Collection is between 9:00-9:30AM, return by 12:30PM; or collect 1:00-1:30PM, return by 5:00PM. Please note that even if you don't intend to depart with the Katakanu immediately, all participants must meet at the In Your Element Office between these times so we can fit you with buoyancy aids correctly. Once done, you can go paddling whenever you are ready. Katakanus can also be hired in person from the In Your Element Office by the marina during the times stated above. Bookings are subject to availability on the day. If you would like to hire a Katakanu for a full day, please email us at fun@iye.scot so we can check availability and book it in for you. Full day hire costs £90 per katakanu.